YEP. I made it for dinner. I took pictures. I remembered the camera. I'm posting it AAALLLLLL. Thank you Gordon Ramsay. It was good. I had pretty high expectations and the meat definitely held up those expectations. I was wary of the salad. 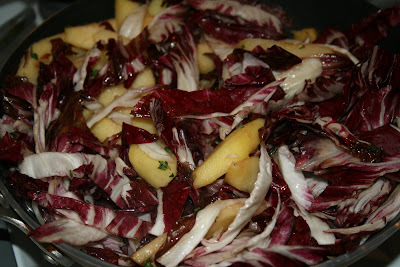 I'm not a fan of raddichio (or Belgian endive by another name). The combination with apples and fresh thyme was refreshing. I used tempura mix from a box so I didn't have to slave over it from scratch. Little timesavers like that kept me moving so dinner took altogether only about 30 minutes to prepare. This link is to the original recipe. And now for what I actually did. 2. Flip pork. 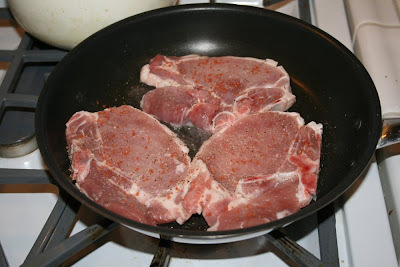 Rub garlic over the pork chops, then push down into the bottom of the pan. Add sage and butter. Dribble the juices over pork as they cook another 5 minutes. 3. 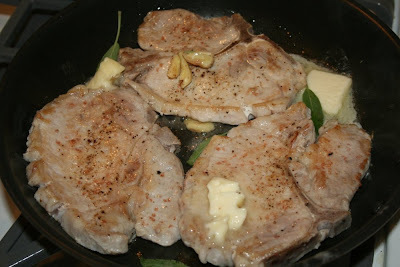 Remove pork, sage, and garlic from pan. Put somewhere it can stay warm (in the oven, or warming drawer). 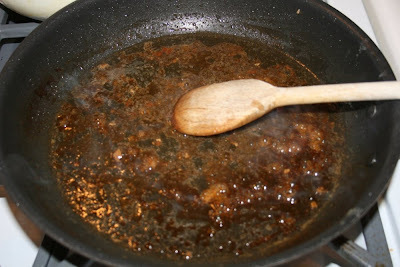 Deglaze the pan with the marsala wine. Let simmer until wine has reduced and is syrupy. 4. 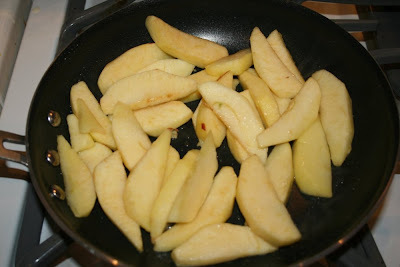 In another pan, heat the olive oil and add apples. Cook about 5minutes. 5. Add sliced raddichio and cook until they start to wilt. Add chopped thyme and cider vinegar. Stir up and cook about 1 more minute. Keep warm. 6. Meanwhile, have a small pot of vegetable oil heating. I have no idea how hot it was, but it was hot. 7. Make tempura mix according to the package directions, which involved adding water and whisking. Dip zucchini sticks in the batter and immediately drop into the hot oil. Fry about 3 minutes. 8. Remove from oil and drain on paper towels. Sprinkle with salt right away. 9. To serve arrange a heaping spoonful of salad on plate. 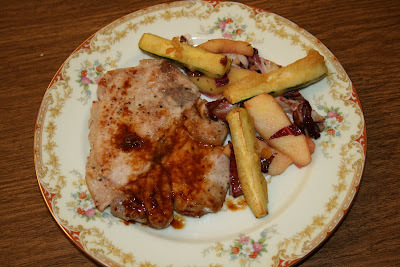 Place pork chop next to it, drizzle some of the marsala reduction over the pork. Arrange fried zucchini on top of salad. Notes: I couldn't find lemon thyme like the original recipe said. Regular thyme worked fine. I noticed Marsala wine is an awful lot like sherry and I always have cream sherry on hand for cooking, so don't be shy about making that substitution. I also cooked the pork a tad more than Gordon's recipe. Being at high altitude and liking our pork Not Rare, it seemed like a good idea. 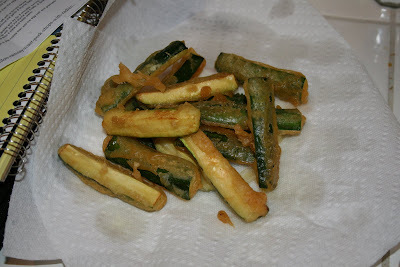 I think the zucchini's tempura coating was too thin. Next time I will use slightly less water. As much as I like the combination of apples and raddichio, I will probably tweak that part to involve about half a head of raddichio so the salad isn't so bitter.